Use the numbers on the picture to reference the internal components of the Stiebel Eltron water heater with the description of each component below. While the model pictured is a Tempra 24, all models share the same components. The difference between the various models is determined by the number and size of the heating modules. Sophisticated microprocessor-controlled electronics adjust the power output of the heating elements based on flow rate and incoming water temperature to precisely regulate the output water temp. The muscle of the system! 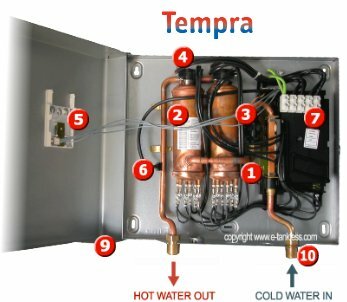 A series of very high output heating modules (up to 3, depending on model) are used to heat the water as it passes through the heating chambers of the water heater. The Heating chambers are manufactured with copper - no cheap plastics here! Safety first! Each heating element is protected by thermal limit switch, a back-up safety feature that will automatically turn off the heating module if a potentially unsafe output water temperature is reached. This reduces the risk of scalding injuries for children and the elderly, and protects the unit from damage if the microprocessor-based thermostatic control fails. Set it and forget it - use the simple dial control to raise or lower the temperature setting. 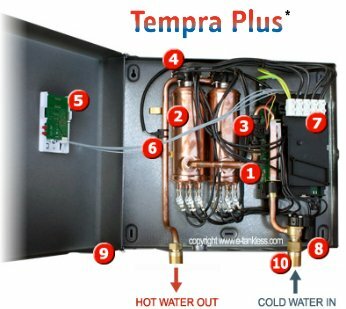 Tempra Plus as well as Tempra 36, 20, 15, and 12 models are equipped with a digital temperature setting display. The temperature can be set at any level from 86F (30C) & 125F (52C) [up to 140F or 60C on Plus Models and Tempra 24]. Convenient terminal blocks are provided to ensure a quick, simple, and safe installation. The inlet water pipe includes a small screen filter that ensures that no debris is able to enter the system. This filter should be periodically cleaned for optimal flow performance. In most cases, this need only be done once every few years, but the exact frequency will depend on your water quality.